During the event we were able to share with local entrepreneurs how we leveraged and a/b tested our referral program to drive 1/3rd of our growth. Joe Anhalt, the marketing manager at Interior Define, joined us to present his recent blog post about leveraging SEO to build on our referral program and avoid doing laundry for 18 months. DRYV sponsored Lunch & Learn at WeWork. At DRYV we give our users the ability to easily share their experience with their friends and family. By adding referrals into the home page of our app and a/b testing copy in text referrals we have driven growth while keeping cost a steady $10 per referral. Word of mouth is a powerful tool and (validation from a friend) + (free cleaning) = increasingly loyal customers. SEO is a powerful tool but when combined with “The Perfect Storm” as he called it, one can bring in a lot of clicks and conversions. Joe is an expert in driving traffic to his blog with SEO and retaining readers with valuable copy. For Joe our organic growth created word of mouth while shares of his blog post created a snowball effect that earned him over $2,000 in referral credits. As we grew fast so did the searches and in turn his referral credits. Increase your happiness and energy throughout the day by setting a goal to workout for 5 minutes every morning before work. Download Hot5 Fitness App to learn quick workouts from professional trainers. Forget paying for an expensive trainer, now you can do it all on your own. Many successful people say that time is the most precious commodity in life, so why would you waste it on something like chores? Did you know the average adult spends 23,214 hours of their life dealing with laundry? This year you don’t have to waste your time anymore. You can get all your clothes cleaned, on demand, through dryv.com, imagine what you can accomplish with 23,214 hours of free time. Make this year the year you finally learn a new language. The easiest way to learn a language is here, sign up for Duolingo and take a 5 minute lesson everyday, for free. In just a few months you could speak French, German, Spanish, Danish, and many more languages. The most noticeable difference in collar types is their spread. Spread is the distance between the two collar points. Depending on the width of your face you should shoot for a collar that will even it out. Go get yourself some trusted measurements. You don’t have to buy anything right away but save the measurements for later. One classic rule of thumb is that your sleeves should end on your wrist not over your hand, don’t be that guy. It is important to care for your clothes, not only so you look fashionable but so your clothes last longer. Routine pressing and correct storage will help your suits and shirts breathe. Dry cleaning removes the pesky grease and oils from your clothes unlike a regular wash with water. With on-demand cleaning like DRYV there really isn’t an excuse. If you are 6′5″ don’t wear a one button suit… Make sure to dress accordingly. One button will do for anyone on the shorter end. Increasing buttons as your height does. However, the best rule of thumb is a two button suit looks good on an average height male. Now go forth and be fashionable. We are teaming up with our friends UberEATS, Foxtrot, Whittl, and Luxe to provide one Chicago office with a holiday happy hour. All you have to do is visit this site and enter your work email. Make sure to share it with your colleagues to increase your company’s chance of winning. Our friends are helping us provide you with munchies, booze, and some goodies – everything you need for a solid happy hour. UberEATS delivers the best dishes in Chicago in ten minutes or less! Open your Uber app during lunch (11am-2pm) or dinner (5:30-8:30) to request your EATS curbside in minutes. Foxtrot offers curated selections of beer, wine, snacks, and everyday essentials. They also have two stores around the Chicago area. Whittl allows you to book and pay for appointments through your phone. Everything is online so you are in and out quickly. Luxe is an on demand valet service. Certified valets will pick up your car and return it wherever you want, they will even wash it if you ask. Now it’s time to enter and win a holiday happy hour for your office. What are you waiting for? We have all experienced the brutal winter days in Chicago when all you want to do is lay in bed. Between work, the cold, and everyday chores it is hard to stay positive and find free time. So here are a few suggestions to help get you through the your first Chicago snowfall. Utilize the many on demand food sources like UberEATS and Foxtrot to keep you from having to lug takeout back to your home. To be honest you shouldn’t have to leave your house anyways. Don’t even think about your chores, winter is hard enough. Order yourself a laundry and dry cleaning pickup. You can also request your fellow neighborhood cleaner to come by and tidy up your place from Handy. It’s time to buckle down with Netflix or HBO Go. Get yourself started on a new series and strap in for some quality couch time. 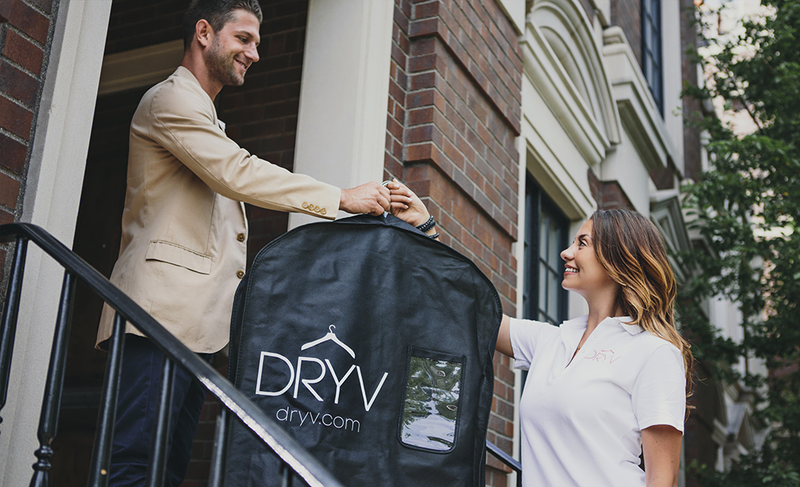 You can have DRYV do your dry cleaning and laundry. Enter you email to stay up to date on the newest lifehacks, tech, and fashion.